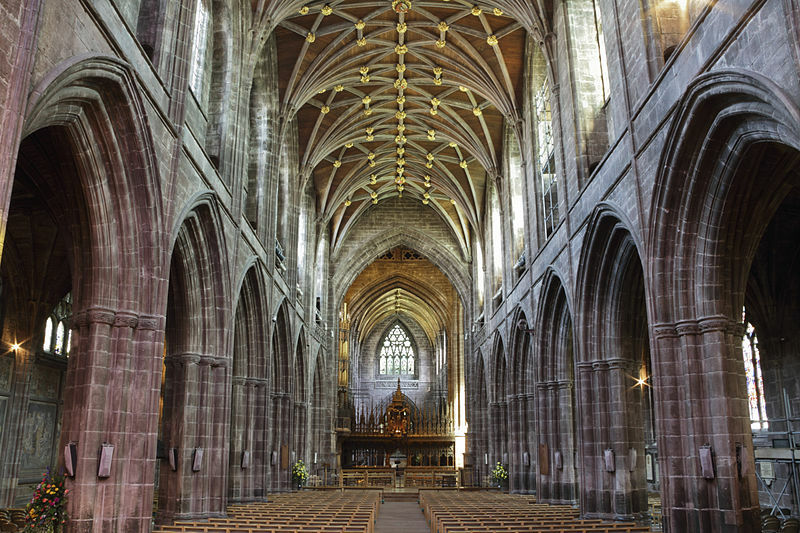 There is a legend that a Druidic temple existed on the site of Chester Cathedral. The city of Chester was founded in 75 AD and was an essential Roman stronghold. There may have been a temple on the site during Roman times and when Christianity became the state religion in the fourth century, this temple might have become a Christian basilica. During Anglo-Saxon times, there was a chapel dedicated to the seventh century princess Saint Werburgh. She received permission from her father to enter the Abbey of Ely, remained a nun most of her life and was instrumental in convent reform throughout England. Werburgh’s father, King Wulfhere of Mercia, founded a church at Chester c. 660. In 875, the relics of Saint Werburgh were brought to the church and a shrine was built. In 907, King Alfred the Great’s daughter Aethelflaed, Lady of the Mercians transformed the church into a college of secular canons. The collegiate church was in need of restoration and this was paid for by Leofric, Earl of Mercia and his wife Lady Godiva in 1057. By 1090, the secular canons had been evicted and the church had been razed to the ground. No trace of this building is left other than a small amount of Saxon masonry found during excavations of the nave in 1997. In 1092, the nephew of William the Conqueror, Hugh Lupus, Earl of Chester was determined to found a Benedictine abbey in the heart of his administrative capital. After three invitations, he finally persuaded Anselm, the Abbot of Bec in Normandy and one of the celebrated theologians of his day to come to Chester and establish the new foundation. Work on the monastery began that same year in the Romanesque style. The east end was completed and consecrated so services could begin. While building was continued on the church, the cloisters were erected. The Chapter House was finished in 1250 and by this time the architectural style had changed to Gothic with pointed arches and ribbed ceilings. The new Gothic style made the Romanesque portions of the building appear unfashionable so rebuilding began around 1260 with the construction of a Lady Chapel at the east end and remodeling of the quire in 1290. The crossing was built in 1300 followed by the south transept in 1350. The south side of the nave was refashioned in 1360 but the north side was not constructed until 1490. This one hundred and thirty year gap was due to the shortage of workers caused by the Black Death. The west end was built c. 1515 and then work progressed aloft to the upper windows and stone ceilings. During the Dissolution of the Monasteries in the reign of King Henry VIII, building ceased, the monastery was disbanded and the shrine of Saint Werburgh desecrated. 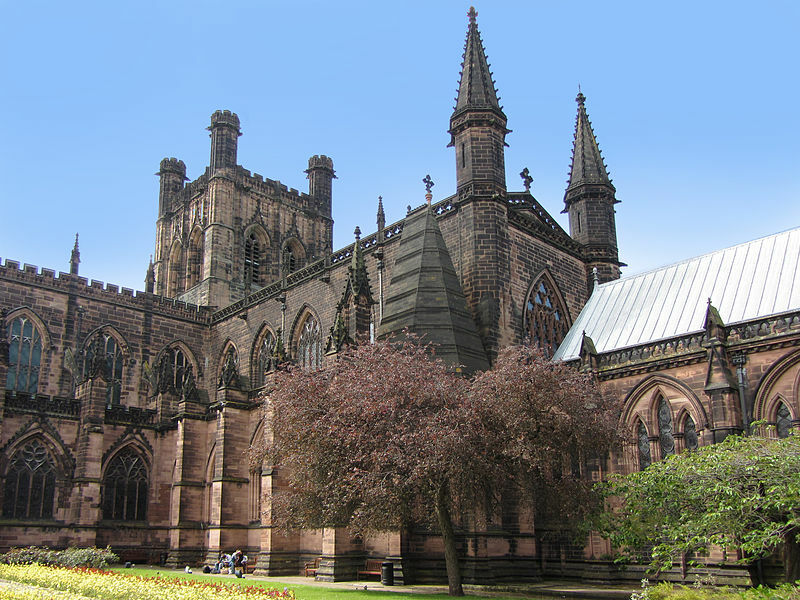 In 1541, in an unusual move, Henry ordered a new diocese be created and St. Werburgh’s abbey became the Cathedral of Chester, safeguarding the building from destruction. The last abbot of the abbey became the first dean of the new cathedral at the head of a secular chapter. Most of the construction before the Dissolution had been in the Perpendicular architectural style and a Tudor entrance was built on the west front. Although there were additions to furnishings and fittings in the seventeenth century, there was no major construction. By the nineteenth century, it was evident the building needed restoration and some work was done in the 1830’s. Extensive restoration was performed from 1868 to 1876 and the homogeneous appearance the cathedral depicts from many exterior angles in the present is largely due to the work of these Victorian renovations. Further work has continued into the twentieth century. A detached Bell Tower was erected in 1975 and maintenance and restoration is ongoing. Each part of the cathedral combines the work of all the different generations and architectural styles to make the magnificent building we see today. Thank you for this contribution to Mercian history, which we are trying to promote. Also you may be interested in The Two saints Way, a walking route linking Chester and Lichfield. Thank you Christopher! The walking route sounds interesting. And I’m working on more Mercian history. You’re welcome John. I enjoyed learning about it and would love to visit someday. Thanks, Susan for another very interesting post. It becomes mind-boggling to place oneself back into the earliest dates you give for constructions on this site to say nothing of the different types of religious activities performed. You’re welcome rafterd. I enjoyed finding out about the varied religious history of this site. I know Rufus, I had the same question! I did look but couldn’t find anything to explain the circumstances of the destruction. It certainly wasn’t unusual for this type of thing to happen back then. If you find anything, let me know. This is a great post!!! I will like to re- blog !!! !